When heavy rain was forecast for Sunday 3 September, Thornton Heath Festival 2017 stood every chance of being a wash-out for the first time in a decade! Key members of the Festival Management Committee, Tony Rowland, Cllr. Callton Young OBE, Cllr. Pat Clouder, Hon. Alderman Adrian Dennis, Karen Barnett and Cllr. Karen Jewitt were therefore on tenterhooks as Thornton Heath High Street was closed to traffic at 6am that morning, to make preparation for the day ahead. Heavy lorries rolled in, ladened with the all important Fun Fair rides. No Thornton Heath Festival is complete without them! Then there was the arrival of the central stage, the stallholders and the band of volunteers who help the day run smoothly. All of this happened under the watchful gaze of our professional group of SIA approved security officers led by Renford. Fortunately, rain did not come until the end of the Festival. And by then both revellers and performers alike were in the groove! So the band played on, singers sang on and the crowd danced on, full of the joys! Indeed, this Festival eclipsed many others to become one of the most enjoyable yet! Above are some photos of the best ‘people’ moments towards the very end of Festival as rain started to fall! There were smiles all round! Topping the bill was Soca maestros, One The Band, with international Soca singer Ms Desire! Having secured a record deal with Caribbean giants VP Records, her new album had been released just days earlier. Thornton Heath Festival was therefore in a privileged position to hear her new songs fresh off the press and was not disappointed. Ms Desire blew the metaphoric roof off the High Street! The crowd danced like there was no tomorrow to tunes like ‘My Team’ and ‘Girls Just Wanna Have Fun’. What a voice! What a performer! What a band! They stayed transfixed by the stage, which Ms Desire both owned and controlled. Wet through, they danced and sang along with her, even calling for an encore! A first class performance by Ms Desire and One The Band was matched only by a first class crowd. Ms Desire told them in her grand finale that ‘Thornton Heath is the best’. It is true. Watch her performance in the video below. Earlier in the day the Festival was lit up by Leah McKenzie a Croydonian who progressed through to the Boot Camp stage of X Factor! Once Leah started singing it was easy to understand why she was an X Factor success story and had since become ’The Face of Croydon’! She ‘threw it down’ on stage and the crowd loved every minute of it! Singing cover versions of well-known hits like Relight My Fire went down a treat. But it didn’t stop there. Singer-song writer Leah wowed the crowds with some songs of her own like One Love, One Life, which contain powerful social messages seemingly reflective of her character and brilliant personality. Leah McKenzie, The Face of Croydon, is definitely one to watch in more ways than one. Check out this video of her performance at Thornton Heath Festival 2017. Skillosophi is a local reggae band that knows how to put a ‘Big Fat Smile’ on people’s faces! Born of roots and culture, this band fuses positive lyrics with positive vibes! If anyone at the Festival thought they did not have a ‘sing-along’ in them, then they know now as Skillosophi went ‘interactive’ with the crowd in a cool ‘Ital’ way. ‘Seen’! Try watching this video of the performance without singing along! And then try getting the song out of your head if you can! It is too good to forget! Kimberley SK, Thornton Heath’s very own reggae and RnB star gave stunning performances on stage for both the adults and children. She really showed off why she is known as ‘Special K’, having natural talent and an ability to switch effortlessly between a variety of music genres. Kimberley SK is a great supporter of Thornton Heath Festival whether on stage or joining in the fun with the crowd, and they adore her for it. Here is a short video of one of her performances. We added some gospel rap to the Festival this year. FEGs and KingdomKid gave two highly entertaining performances with solid messages. The song ‘No Knife has particular social relevance nationally at the moment. Your can hear the song and Vision by KingdomKid here. Next up was local singer Felcity Triner with her acoustic accompanist. She was another performer promoting a new record release. Then came the professional dancers! And ‘Bwoy’ could they dance! Flagz Mas Band did a Socalicious dance routine! Nothing like this had been experienced at Thornton Heath Festival before! A taste of Notting Hill really did arrive on our doorstep! The costumes were as spectacular as ever. Last year’s resplendent green, blue and orange costumes were again on show but now, alongside, was Falgz’s new Futuristic design in white and silver, with touches of iridescence as seen in the head dress pictured on the Band’s leader Eon. Both sets of design are so good, it is difficult to chose a winner between them! The high standards and quality are a reflection of the care and commitment each wearer personally puts into their costume in order to compete at the Notting Hill Carnival and then perform at Thornton Heath Festival. Flagz Juniors showed of their costumes and dance moves at the Festival too and did the Band proud. Not to be outdone, Flagz Seniors did a not-to-be forgotten dance routine to the heavyweight Soca tune ‘Buss Head’. Watch this video of their performance. It’s simply brilliant. Now I don’t want to be overly exuberant but Aim High Dance Academy ripped the Festival stage apart with a succession of street dance routines that left onlookers open-mouthed in awe! ‘If only I could dance like that’ I heard one teenager say. The truth is dance lessons at the Academy are only a telephone call away! After performing, these three amazing dancers – Katrina, Angelo and Cate – gave the crowd a dance class, with revellers, young and old, joining in Nae Nae, Candy and other popular dance routines. Take a look at our video footage. 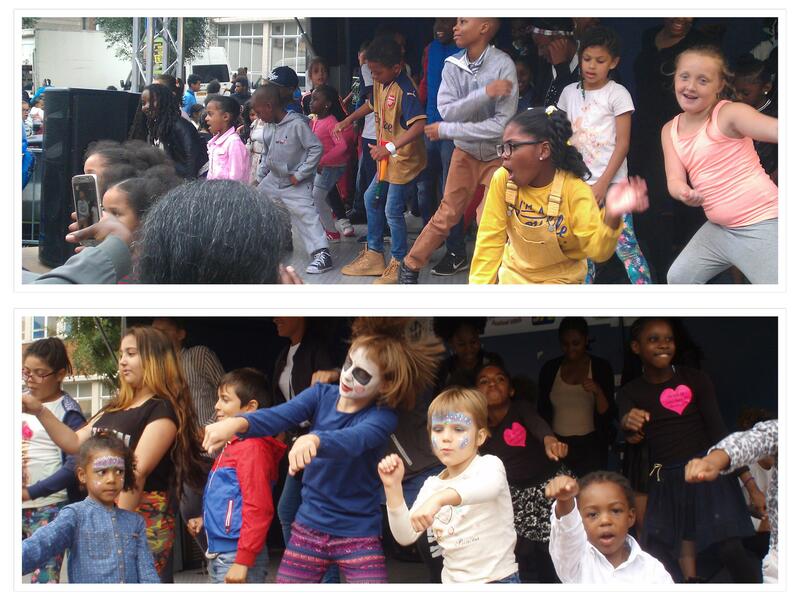 These dancers combined to help to create another classic Thornton Heath Festival! Salsa Naturally, another Thornton Heath Festival favourite, is a local dance company run by Ruth Ferguson (mike in hand), and it brought on yet another delightful dance fest to the stage. The crowd were given a brief lesson of gyrating hips and counts of seven steps per set, before things took off! And they did! The stage quickly filled with revellers and peals of laughter as Thornton Heath went Latin. It has got to be said that the lady wearing the pink trousers appeared to have the most enjoyable of festivals of all, and in next to no time was a salsa queen in her own right! New Image Duo brought a wonderfully combined Michael Jackson and Street Dance routine to the stage. Who’s BAD rang out? They were, in the street meaning of the word, as they moonwalked, crotch-grabbed and white-socked most of Michael’s famous dance moves for the audience. Finally, no Thornton Heath Festival is complete without a Parade and this year was no exception. It was started off by the Mayor of Croydon, Cllr. Toni Letts, who graciously spent many hours with us all during the event. This was greatly appreciated by the crowd and stall holders alike. They loved her! Here she is with some members of Flagz Mas Band and, of course, that local legend and outgoing Festival Chairman Tony Rowland. Watch out for next year’s Thornton Heath Festival! It is always early in September. Follow this site to keep up to date about it. Well, Well! Thornton Heath was buzzing today as locals stopped to read banners, posters and flyers promoting this year’s Thornton Heath Festival which will take place on Sunday, 4 September. The event will be held on Thornton Heath High Street. It will start at noon and run throughout the afternoon, finishing at 6pm. The street will be closed to traffic. Flagz Mas Band, some of whose members feature at the top of the flyer above, will need no introduction to Thornton Heath Festival goers. They have joined us for the last two years. Triniboi Joocie features at the bottom of the flyer in a shot taken at last year’s Festival. The faces in the crowd tells the story of his massive impact! Follow this link to get a flavour of this UK Soca talent: https://www.youtube.com/watch?v=SNpU9lFbmSI). If having a UK Soca King at the Festival is not enough reggae King, Dani-i, will also be performing this year (https://www.youtube.com/watch?v=MYNt6JM_0JE). Love it! There will be plenty of other local reggae stars too like Kimberley SK (opposite), Suzie Jay and Tonica Howe. We will also have up and coming Hip Hop artist GTsolo in our line up. Incidentally, he was raised in Thornton Heath and remains Croydon based. It is great to see how much home grown talent is coming out of the Heath at the moment, what with Krept and Konan and Stormzy! We have a class act of dancers lined up too! Festival favorites, Tamil Cultural Dancers, will be back to share their traditional South Asia moves (See photo right). In addition there will also be modern, street, belly, salsa and other forms of dance. Remember Chantel of Hipsinc! There will be a mass dance too, to encourage everyone to ‘throw shapes’. Check out the youngsters below! Come prepared! No Thornton Heath Festival would be complete without a carnival parade with processional pieces and carnival flair! This year is no different. The parade will start at 3pm. It will include pieces made with tender loving care by local schools and organised by local artist Karen Barnett. Also costumes made to a professional standard for the Notting Hill Carnival by Flagz Mas Band. Why not get involved in Thornton Heath’s Festival by helping to carry a processional piece in this year’s parade? Just come along and ask! You can join in with the soca dancers too. Most of all, do enjoy what has always proved to be a great family day out. Whether it is browsing the many stalls at the Festival, enjoying the variety of food on sale, the funfair, the stage acts, the carnival, the friendly atmosphere or just blowing bubbles, Thornton Heath Festival 2016 is a must keep date. So see you there! Thornton Heath Festival is a not-for-profit body! Funds generated from the 2015 Festival have been spent on new Christmas lights for Thornton Heath’s High Street! Everything made goes back into our local community! The new lights will be switched on at the Clock Tower at 5.30pm on Saturday 21 November 2015. The honours will be done by local singer Kimberley ‘SK’, who will also warm hearts with a few songs of Christmas cheer. The Acts Christian Church choir will sing Christmas carols to add to the festive spirit. Why not pop down to the High Street at 5.30pm on Saturday to see the lights being turned on and to support your local community? If you have not done so already, you may wish to look at – and Like – our Facebook page which provides a good photographic record of what was an excellent day all round for Thornton Heath’s community this summer.